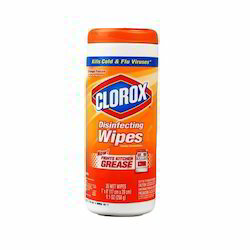 Being one of the reckoned enterprises in the market, we are offering an optimal class gamut of Disinfecting Clorox Wipes to our patrons. With our in-depth knowledge of this domain, we are actively engaged in trading an excellent quality range of Clorox. We are one of the leading organization engaged in supplying a remarkable range of Disinfectant Wipes. Offered products are made from high quality Bardac 208 M and other allied material such as surfactants, builders and fragrances. We hold expertise in this domain and are involved in offering a quality-approved range of Medical Disinfectant Wipes (Bemcot Super CN). A broad category of disinfectant wipes; a goof travel companion. These wipes are devoid of alcohol. Clinell Alcoholic 2% Chlorhexidine wipes contains Chlorhexidine Gluconate BP 2% & Isopropyl Alcohol 70% and are available in individual sachets. Product description Disinfecting wipes for cleaning tough stains. WETTASK® with Bacillol® 25 Surface Wipes is a hygienic disinfecting system. 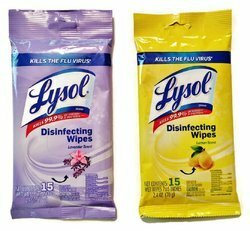 These wipes are special researched wipes, pre-saturated with the surface disinfectant Bacillol® 25 which is time tested, aldehyde free, quick acting, effective against bacteria, fungi, viruses incl. HIV, Rota, Herpes, etc. and dries without visible residue.